This sweet little guy is REALLY old (this one is about 280 million yrs); which is really cool, and really important. So much is often said about the wisdom that comes with age... And about many things getting better and more beautiful with age and the passage of time... This sweet little treasure for sure proves those statements to be true. As you hold it up in the light you can see its graceful curve and you can see that its outer coating has changed over time to be kind of softly iridescent. It didn't start that way. It was already wonderful. But as it drifted toward the sea floor dying, it probably could never imagine that death would have no power to wipe away the truth and the glory of its existence. That it would forever continue to display God's amazing artistry. That it would become even more miraculous over the eons. I'm sure it didn't know that it would become a most amazing analogy for our lives... And that is one of the main reasons that I adore ammonites so very much. I love the mathematical curvature, the iridescence, the textures on the surface and its needs and habits that are so like ours. Because they are truly that near perfect analogy. 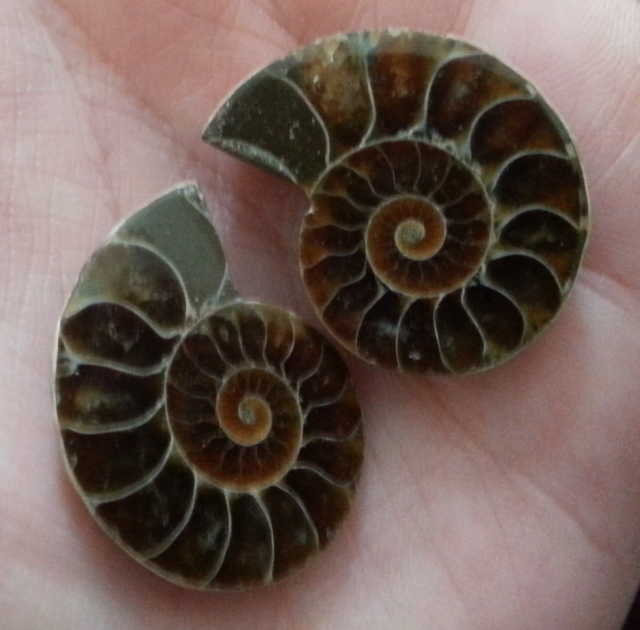 This little ammonite is like you Robin and Mikey. Miraculously both separately and eternally together at the same time. Its so sweet and beautiful in its expression of God's creative Love. It is a miracle in its existence. But looking deeper into its needs and its actual existence during its life, the story unfolds much more... It truly is so like our souls and our living experience. Life was difficult and dangerous and fraught with challenges and tests. But one thing that made the ammonite a special creature is that unlike its co-mariner the snail, who also were very interesting and nicely curled; it had the special gift of floatation. While the snails curved slowly around and around they did it off centered. And...glued to the bottom of the ocean floor. They had to watch the Ammonite float around, choosing with free will where it decided it wanted to be. How high, how deep, which direction it wanted to go, it went. With one BIG requirement. 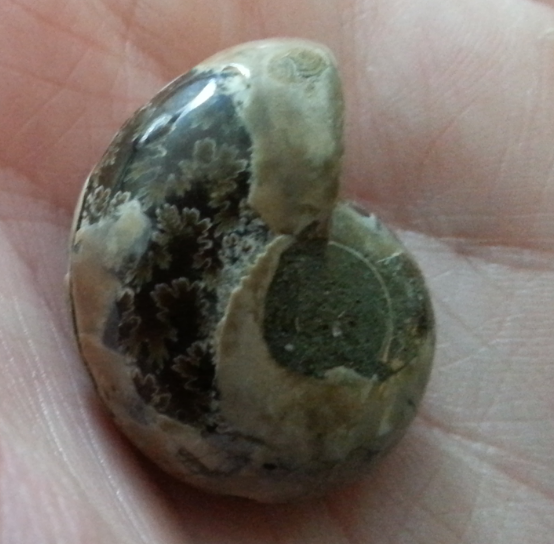 You see the ammonite coils in the same plane as it grows and goes through life’s changes. And it grows one chamber at a time, one after the other after the other after the other. No shortcuts. No detours. You can't skip one, go around a few to get past a bad couple of chambers to get to the really good big roomy chambers in the middle or the end. And the ammonites life’s anointing and freedom and success is a specialized little air chamber that runs through and connects every chamber from birth to death. They are able to control this chamber to allow themselves to float at different levels and to stay upright. If they loose control of the ability to keep themselves floating upright they cannot keep themselves growing in that perfect plane. And if they are injured or sick or get into a situation they didn't have the ability to maintain control of to achieve this feat...they will start to lose their balance, lose control...start to sink to the bottom. And if not able to correct this and get back into that perfect plane, they will float to the bottom and die stuck in the mud or be consumed by a predator. And my personal testimony is that that is sooo like our existence and our relationship with the Lord. We are born, we live and grow through one chapter at a time. No matter good or bad, successful or tragic or nondescript, we must grow through each one, one at a time. And if we have times where we get wounded, distracted or just choose to go off in a wrong direction, get lost and find ourselves getting out of that perfect plane of God's love and purpose, we start to drift and sink, struggle and die inside until or if we get back into that perfect plane with the Lord. And so as it looks sweet, wonderful, beautiful the most wonderful thing of all is......what's locked inside. It turns out that this singley whole precious creature that is so representative of the sweet beauty of “Robin and Mikey” now has two perfect halves. And then it reveals its sweetest miracle.